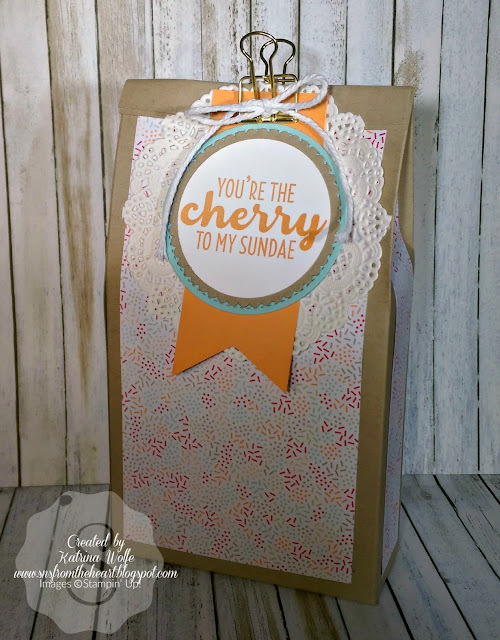 Katrina's Kreative Heart: Sweet Treats in a Bag! Happy Tuesday! I hope you all enjoyed your St. Patrick's Day festivities. Today, I wanted to share a cute little treat bag I made using the Cool Treats stamp set and Tasty Treats DSP. The pattern I got from Ronda Wade and it is so quick and easy that I decided to make one. I just changed out the DSP and the stamp set and this is what I came up with. This is such a quick and easy design and it's the perfect size for so many things. You could provide a small package of cookies in here, a couple bolts of ribbon as a gift or other crafty embellishments, and the list goes on.